George Wyndham became the father of Australian Shiraz after he planted Australia's first commercial Shiraz vineyard in 1830. 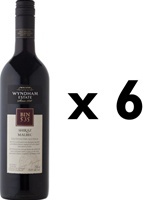 Wyndham Estate is the birthplace of Australian Shiraz -- it is the home of George Wyndham's original estate. Wyndham Estate has unique experience and know-how with Shiraz so naturally, Shiraz is their signature variety. They handcraft intensely flavored Shiraz -- full bodied and bursting with rich, ripe, fruit flavors. Nigel Dolan, winemaker for Wyndham Estate, was named the 2009 Australian Winemaker of the Year by Winestate magazine, and has previously been named South Australian Red Winemaker of the Year, Barossa Wine Maker of the Year and been a finalist in the QANTAS Winemaker of the Year. In 2002, he earned the auspicious rank of "Baron of the Barossa". BIN 535 offers a rich texture and soft integrated tannins. It is the perfect complement to rich tomato based pasta, roasted or grilled meats and hearty slow cooked casseroles.